2006 preview of the Philadelphia Eagles pro football team from the Maddux Sports professional handicappers. 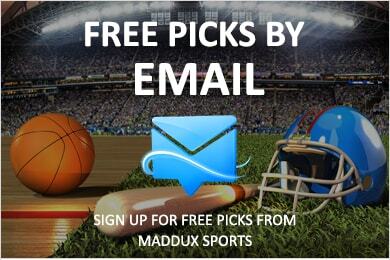 Don't forget Maddux Sports' expert handicapping tips once the NFL Season rolls around for Winning NFL Picks and be sure to view our free NFL odds page featuring live up to date point spreads from 16 quality sportsbooks. Remember when the Eagles were “the” team in the NFC? It wasn’t that long ago. But it may be years until they regain their prominence and swagger. Then again, you never know. Coach Andy Reid doesn’t have Terrell Owens to kick him and the team around anymore. In an injury plagued season, the soap opera orchestrated by Owens was an embarrassment until the team got tough. It’s a new season with last year’s 6-10 record and T.O. behind them. Donovan McNabb (357 ATT, 211 COMP, 2,507 YDS, 16 TDs, 9 INT) looks to regain his stature, and he will, if he’s regained his health. McNabb was bothered by numerous ailments in 2005, including a sports hernia. The team desperately needs him healthy and focused. He can get them back to the playoffs. Another important element is the offensive line. Last season, they weren’t helpful on the rush (28th) or in defending the QB (42 sacks allowed). Coach Reid is dealing with aging linemen, prepping young replacements and a hole at center. The running game is Brian Westbrook’s (156 ATT, 617 YDS, 4.0 AVG, 3 TDs) baby, with Ryan Moats and Bruce Perry backing up. Along with being the team’s leading rusher, Westbrook (61 REC, 616 YDS, 10.1 AVG, 3 TDs) returns as the club’s second-best receiver. Although the Eagles have no star receivers, they possess talent, including second-year man Reggie Brown (43 REC, 571 YDS, 13.3 AVG, 4 TDs) and McNabb’s go-to guy L.J. Smith (61 REC, 682 YDS, 11.2 AVG, 3 TDs). The Eagles would like more depth in this area. The defense looks better than it did last year (23rd in the league). The line, which recorded only 29 sacks, is undergoing major changes, as is the secondary. Shawn Barber will provide some needed depth at linebacker. So much is riding on McNabb, if he’s back, the teams a contender; if he’s not totally healthy, it’s skid row. Also, the frontlines on both offense and defense need to be repaired. Late season games against Indianapolis and Carolina will test this club’s tenacity. This division is tough and although the Eagles should be better than last year we cant see them winning more games than any of their rivals, look for Philly to finish 4th in the East. For more info on the Eagles NFC East division rivals check out the Giants, Redskins, and Cowboys team previews from the MadduxSports.com experts. For more info and news on the 2006 Philadelphia pro football team visit the Eagles team page at NFL.com.